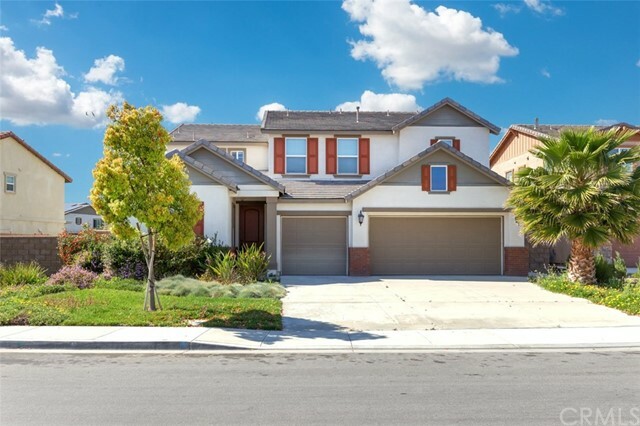 All Eastvale homes currently listed for sale in Eastvale as of 04/20/2019 are shown below. You can change the search criteria at any time by pressing the 'Change Search' button below. 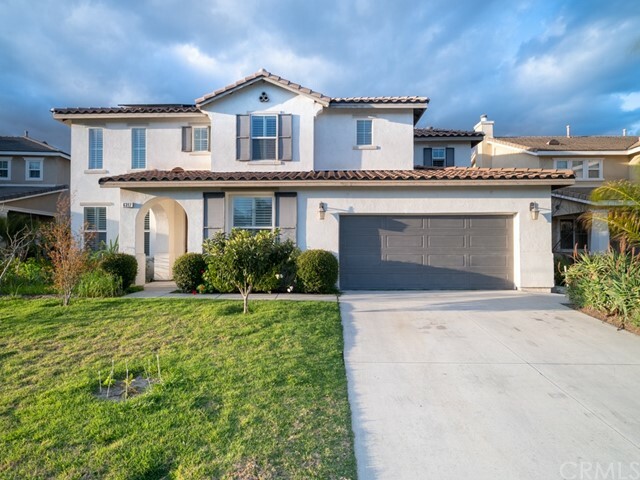 If you have any questions or you would like more information about any Eastvale homes for sale or other Eastvale real estate, please contact us and one of our knowledgeable Eastvale REALTORS® would be pleased to assist you. 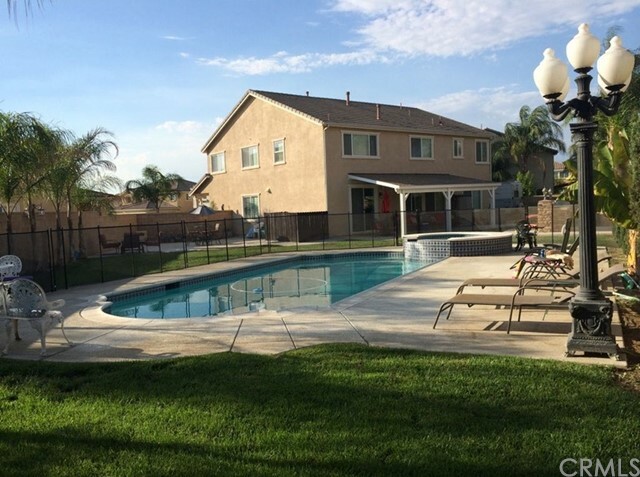 "This resplendent pool home with two master suites is located in the heart of Eastvale. Wood & tile flooring, soaring ceilings, vibrant custom paint, and high-end upgrades throughout the home complement the sprawling floor plan. Enter into the formal living & dining rooms w/ decadent light fixtures and room to entertain in style. The gourmet kitchen is beautifully appointed w/ dark wood cabinetry, granite counters, stainless steel appliances, walk-in pantry, butler s pantry, large island w/ bar seating, and an eating area w/ slider to the sunroom. The welcoming family room w/ wood floors & brick fireplace flows seamlessly from the kitchen. Completing the first floor is a grand, 850 sq.ft. recreation room w/ kegerator sink & refrigerator, and a convenient & spacious main floor master suite. The upstairs master suite features trey ceilings and impressive neighborhood & sunset views. The spa-like master bathroom features dual vessel sinks w/ granite counters, vanity, a gorgeous custom shower, separate soaking tub, and roomy walk-in closet. The secondary bedrooms are generously sized and feature ceiling fans, ample closet space, two shared full bathrooms, and a sizeable loft/bonus room. The upstairs laundry room has a sink, windows, built-in desk & cabinetry. Relax in the sunroom s indoor Jacuzzi, go for a swim in the sparkling pool, or lounge on the covered patio. Paid-for solar will keep your electric bill low! Very close to schools, parks, dining, shopping, and the 15 freeway." "Estancia East pool home on a large corner lot. The residence has 5 bedrooms, 3 bathrooms, office/craft room with built-in storage, and a loft. First floor has a bedroom with an attached full bathroom. Large kitchen that includes top of the line built-in appliances with granite counter tops and back splash. Open concept living with kitchen opening in to the dining and family room making one large room. Three car garage with overhead storage and epoxy flooring. The backyard features a California room, pool and spa with energy saving equipment, artificial grass and small putting green. Professional photos coming soon." 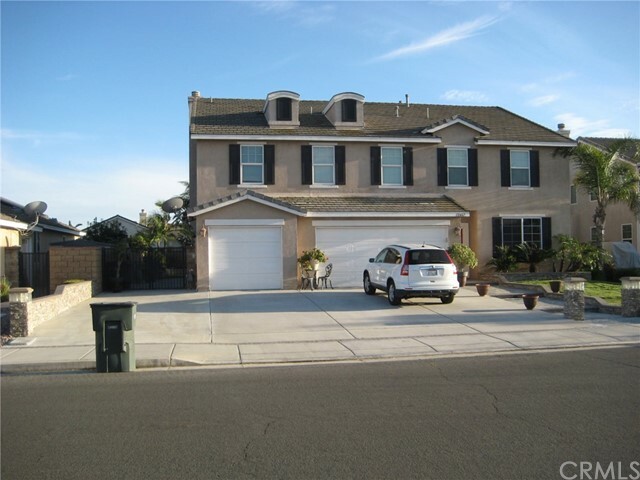 "This beautiful home for you if you are looking for a big house with a big back yard in Eastvale, along with a beautiful view particulary at night time. This home has over 4000 sqft of living space with 5 bedroom and 4 & 1/2 bath and 2 lofts. 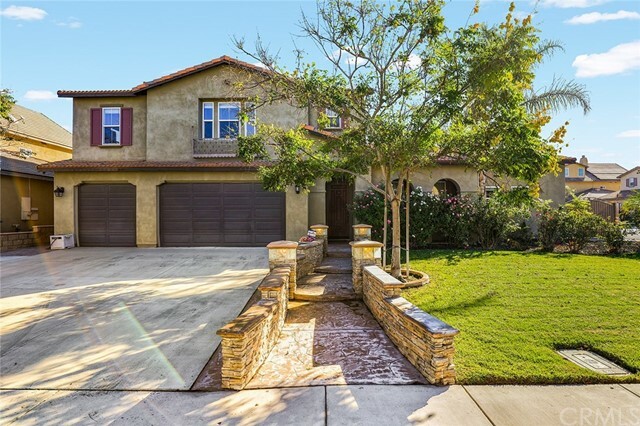 The house sits on an oversize lot ( lot 15682 SQFT) with its back to the Santa Ana River, where there are walking/biking/horse trails. Easy access to freeway 71/91/15/60 and shoping center , walking distance to park, This home is ready to move in! So PLEASE PLEASE come to see and make this beautiful home yours!!!" "Absolutely gorgeous shows like a model. Original owners and pride of ownership. Located in Eastvale. If you are looking for a home that has it all, then this is the home for you. You and your family will see this is not any ordinary home, it is a home that you will see is perfect for you and your family. The home is fully equipped with hardwood floors upon entry and in your family room. the kitchen is fully equipped with stainless steel appliances and a butler's pantry and large ceramic tile and granite counter tops. the large family room has a raised fireplace with a gorgeous view out of the large windows to the backyard that has a large pool with a built in spa. the backyard also features a built in outdoor kitchen with a gas grill and burner with a sink for barbecues and family entertaining. the home also offers a holiday lighting package for putting up holiday lights and a surround sound system. the home has five bedrooms plus a retreat next to the master bedroom and the master features a jetted tub and large seated shower. the home also has crown moulding and wrought iron staircase leading upstairs which also has a loft for your entertainment. the home is also equipped with a surround system and intercom throughout. the home is also equipped with an alarm system, and a tandem four car garage. the laundry room is located upstairs for your convenience, cul-de-sac with ample parking. Bring your buyers, this beauty won t last long." "#THE EVERYTHING HOUSE. Over $150K in Upgrades. 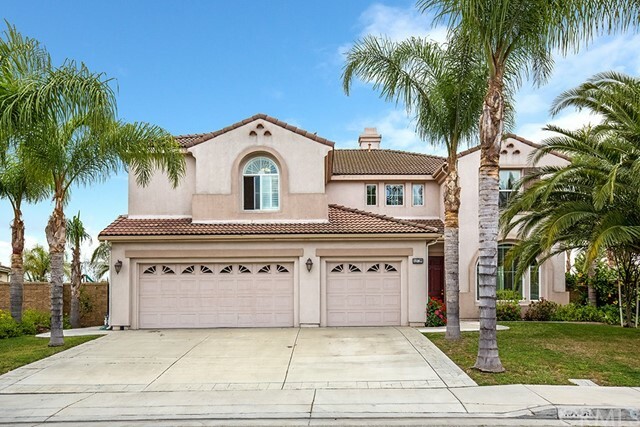 Over 11,000+ sq ft Lot, Cul de sac, 5 Bedrooms Plus a Movie Room with built-in Speakers through-out & back yard, Dining & Living Room, Family Room, Plus Large Loft, Master with Retreat & Double-sided Fire place, Walk-in closets & Built-in Custom Cabinets, Marble floors, Upgraded carpet, Upgraded Granite in Kitchen & Baths, Plantation Shutters through-out, Crown Molding, Upgraded Built-in Stainless Steel Kitchen Aid Refrigerator, Double Ovens, Microwave, Wine Cooler, Trash Compactor, Chef-Style Apron Gas Stove & Range Hood, Custom Kitchen Cabinets, Beveled Glass Double Door entry, Front Custom Porch with Lighted Brick Wall Walk-way, 3 car Garage Plus Extended Side Parking & RV or 5th Wheel Parking, Custom Built-in BBQ Island with Grill, Sink, Refrigerator & Storage, Large Pool with Spa with remote, Custom Back Yard Roofed Patio, Plus Large Cement Area for entertainment & NO HOA'S! Location, Location..."
"An incredibly spacious and inviting home on a corner lot in the community of Saratoga. Large windows throughout the home bring in lots of natural light. This beautiful home is located on a cul-de-sac and features 6 bedrooms and 4 baths. The gourmet kitchen is an entertainer's dream. Large and open, it features stainless steel appliances and a beautiful island, and is open to the family room. The master bedroom has a large en-suite bathroom and a huge walk in closet. Other features: White plantation shutter throughout the home. Dual air conditioners. Newly painted interior, ceiling fans and downstairs laundry room. Don't miss the opportunity to make this your next home." "THE BEST LOCATION!!! BEAUTIFUL MBK HOMES, JUST LIKE MODEL HOME, MUST SEE!! 5 BEDROOMS,4.5 BATHS, (ONE BIG BEDROOM DOWN STAIR FULL BATH, WITH UPGRADED MARBLE SINK TOP AND WALK IN CLOSET. PLUS SEPARATE DEN CAN BE USED FOR YOUR OFFICE AND GREAT FORMAL DINING ROOM WITH DIRECT ACCESS TO KITCHEN. LOCATED EXCELLENT LOCATION, WITHIN 5-10 mins WALKING DISTANCE TO SHOPPING CENTER, BANK, restaurants and SCHOOLS, QUITE, SAFE AND BEAUTIFUL NEIGHBOR HOOD. HIGH CEILING, BRIGHT ROOMS WITH HUGE BACK YARD. NO HOA!!! WOOD SHUTTERS FOR ALL WINDOWS AND UPGRADED MARBLE KITCHEN COUNTER TOP, AND UPDATED MASTER BEDROOMS. DONT MISS THIS SPACIOUS BEAUTIFUL HOUSE THAT CAN MEET ALL YOU NEEDS OF A SWEET HOME." 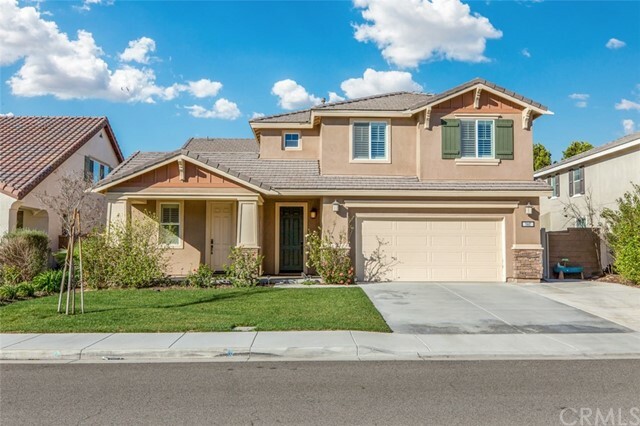 "Well maintained split bedroom Pulte home on one of the largest lots in Eastvale, located in a quiet cul-de-sac within walking distance of Deer Creek park, Parks and Ramirez schools, Eastvale Community Center, Albertsons and CVS. Office with shared fireplace, living (currently a home gym) two story dining room and a dining courtyard, greet you as you enter, leading to the spacious family room with fireplace and 2 media hookups, the kitchen with casual dining, large pantry cabinets and roll out shelves. The first floor also has a powder room, a large under the stairs storage closet and the guest/mother-in-law wing with 2 bedrooms and full bath. The master wing is a light and airy 468sqft bedroom, lux bathroom with separate shower, soaking tub and linen closet, and a master closet anyone would envy. Also upstairs is a bright playroom/den and 3 more secondary bedrooms, even the smallest holds a queen, with custom closets, a full bath with double vanity and privacy door, the large laundry with sink and more storage. On the .27 acre lot there's a small vegetable garden, equipment shed, workshop with storage loft, extra driveway parking space convertible to RV parking, on-street waste bin storage area, and still room for a pool. Full coverage, zoned sprinkler system keeps everything watered without worry. The 3 car garage has been painted and has epoxy floors. The whole house has been wired for fiber optic internet/cable and phone and is covered by multiple service providers." "A beautiful Model home. 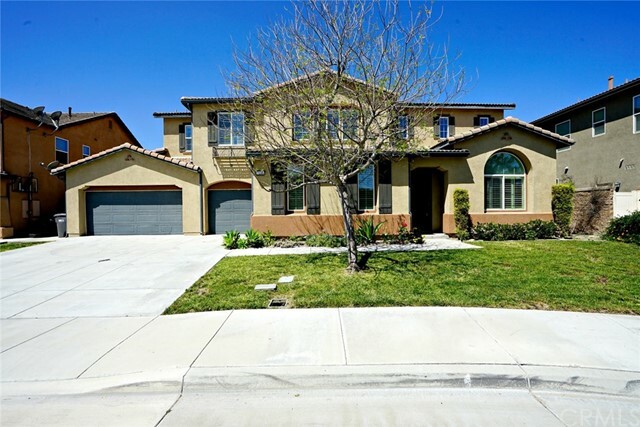 this large family home in Eastvale boasts 5 bedrooms, 4 bathrooms and plenty of living space. Large guest suite downstairs with attached bathroom and walk-in closet. Also downstairs are 2-car garage, office with private entrance, formal living and dinner area, walk-in pantry, and kitchen with a large granite island/breakfast bar open to another spacious living area. The master Suite and bedrooms are all located upstairs, along with build-in storage and a laundry room. Master Suite features a large walk-in and spacious bathroom with separate soaking tub and shower. High ceiling and large windows throughout the home. Large backyard. All furniture, back yard outdoor furniture, refrigerator, washier and dryer, included in the model home for the asking price." "This large beautiful house is in great conditions, almost brand new. 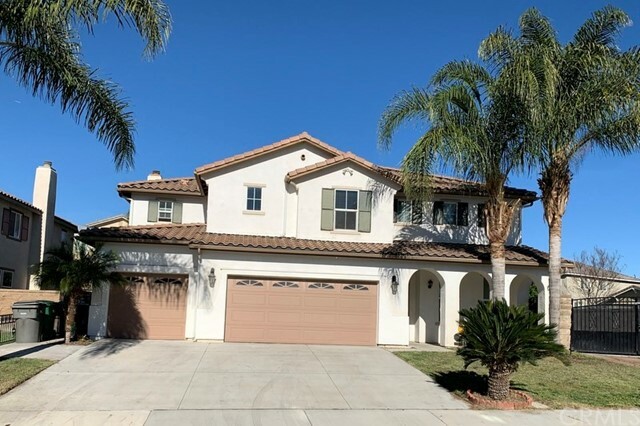 This property has incredible large back yard, which is barely can be find for new construction homes in LA, Orange and Riverside county nowadays. Lots of updates inside, especially for full kitchen upgrades. The house is located in a great neighborhood, nice, clean, quiet, peaceful, harmony and secured. The backyard of the whole community is 10 acres community park under construction, including basketball court, tennis court, golf exercise course, soccer field, BBQ place, children s play ground etc. lots of nice features. Famous Groose Creek Golf Club is right by the community, 5 minuets walking distance to get there from your future home. Another golf course is close by within one mile. Within 2 miles, there are many shopping plaza, including all major banks, all kinds of name brands chain stores, Home Depot & Lowe s, Costco, Walmart, Target, Bestbuy, Edward movies theater etc... There are all kinds of restaurants in these plaza, Italian, Japanese, Chinese, Vietnamese, Mexicans, Americans, it also have McDonald s, In & Out, Panera etc. . 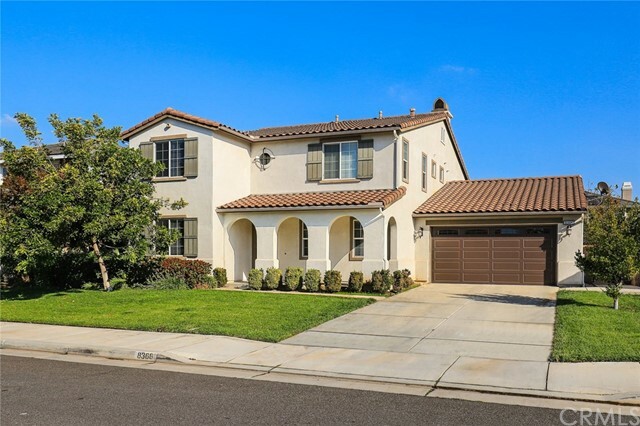 It only takes 10 minuets to Ontario airport, 10 minuets to Ontario mills (10 gates), 15 minuets to Victoria Garden Mall, 45 minuets to Desert Foothills Outlets, 50 minuets to the closest beach, Laguna Beach. You will really enjoy the great location, easy commute, convenient shopping and relaxing life styles of this property and neighborhoods." "Have you ever dreamt of owning your very own gorgeous and luxurious home? If you have now is your opportunity! 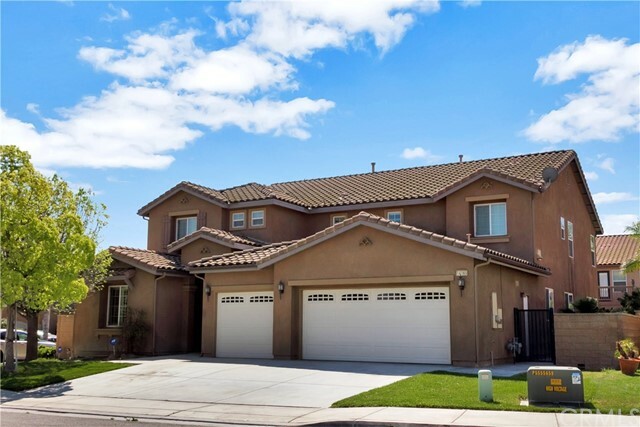 This immaculate 4450 square-foot home features 6 bedrooms (with one suite downstairs), 4 and a half bathrooms, 4 car tandem garage complete with a bonus room and a detached casita with it's own air conditioning unit! If you love to entertain your family and friends, then you'll love the grand entry with the spiral wrought iron staircase, spacious formal entertaining areas and the large gourmand s kitchen featuring a large central island, stainless steel appliances, walk-in pantry and exquisite granite countertops! To top it all off you will find a beautifully landscaped yard with built-in BBQ Island. you don t want to miss what this home has to offer!" 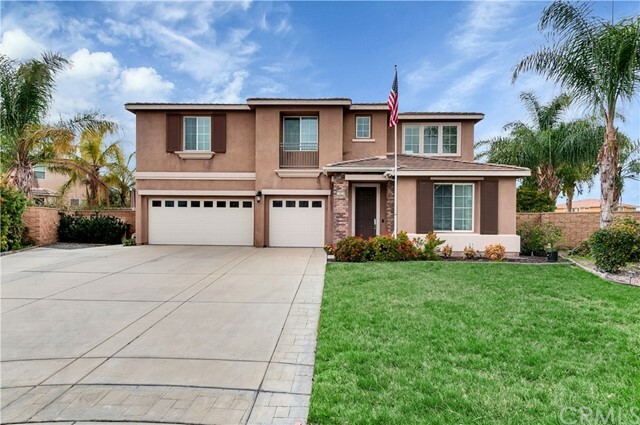 "Absolutely gorgeous TurnKey home like a model located in Eastvale. Beautiful hardwood floorings throughout downstairs, upgraded carpeting in all bedrooms. Granite Countertops in large kitchen with stainless steel appliances and Built-in Nook area. This beautiful designed home offers 5 bedrooms with 5 full baths, and a library downstairs can be the 6th bedroom. The spacious master bedroom with large walk-in closet. laundry room located upstairs for your convenience. Large Window design allows home to have plenty of natural lighting. Tandem 4 car garage with throughout garage door to the backyard. Excellent custom concrete work and the Aluminum Patio cover in the big backyard. Home has Energy Efficient Solar Panels. Four zone Climate Controls with Two A/C Units. Soft Water Filtration System for entire house. 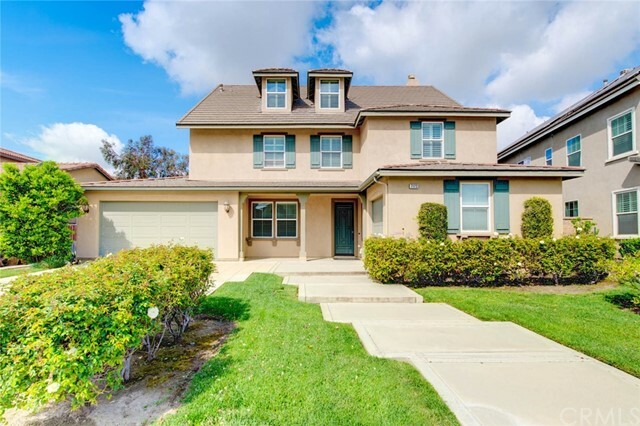 Walking distance to the desirable Schools (Eastvale Elementary, River Heights Intermediate and Eleanor Roosevelt High). Close to numerous Parks, Shopping Center. Easy access to Freeways I-15, I-91, I-60 and 71. Nice location home with great Feng Shui. Don't miss the opportunity to purchase this gorgeous well-designed family home!" "Classic French Architectural Style Model Home built in 2006 features 4 bedrooms/5 full baths plus Library and study room with upgrades. Gourmet kitchen with stainless steel whirlpool appliances, French classic maple cabinetry with knobs, granite slab counter tops with custom tile backsplash. Model home built-ins throughout including Dining room buffet; Library wainscot and full wall bookcase; 2nd floor hallway linens bookcase; double desk with bookcase in study/teen room; Laundry room with cabinetry and sink; coffered ceiling at master bedroom, designer title throughout master bath, leaded glass windows at master bath and entry; decorator paint throughout; electrical upgrades throughout; 42 raised hearth fireplace; Backyard with lattice cover and built-in Barbecue; Garage with built-in cabinetry and glossy epoxy coating floor. Dual zone air conditioning. Quiet neighborhood and convenience for shopping, schools and freeway. It s truly a must see!" "Stunning beautifully designed 5 bedroom, 3 bathroom home with original owners. One bedroom and bathroom on the main floor. Open living room, formal dining room, large family room with fireplace. Gourmet kitchen with granite countertops, stainless steel appliances, upgraded cabinet, double ovens and breakfast nook. Luxurious master suite features an extra retreat and huge walk-in closet. Master bathroom with bathtub, separate shower, and double vanities. Two central air conditions. Individual laundry room is located upstairs with sink and cabinetry. Professional landscaping and easy maintain backyard." "Location, location, location! Being in the middle of it all and close to everything. 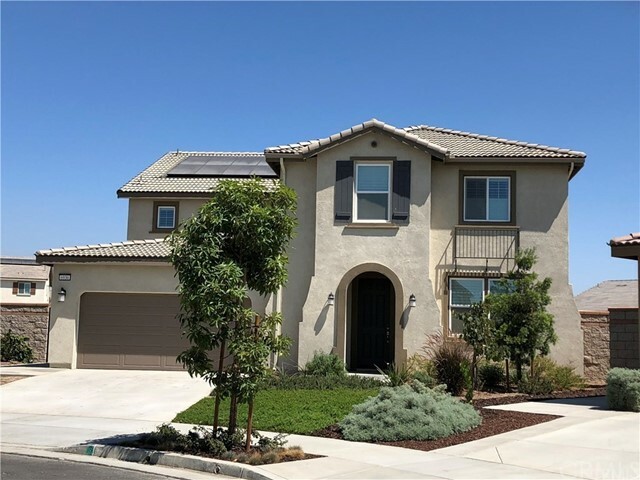 Located in Eastvale, River Road is a community of new, incredibly energy efficient homes within seven miles of the I-15 freeway. Located within minutes of great shopping at The Gateway Shopping Center and a beautiful park, the Ted Brooks Park you will cherish living at River Road. This home includes money saving features such as: Spray Foam Insulation, ENERGY STAR Appliances, ENERGY STAR programmable thermostat, Low E3 Vinyl Windows, SEER 14 HVAC, CFL Lighting and Fixtures, Weather Sensing Irrigation, Water Efficient Plumbing Fixtures and much more. Come visit this home today and start spending your money on your interests rather than utility bills. This home includes 5 bedrooms and a study, formal living and dining areas, 3.5 baths and a 3 car garage. Beautiful interior luxury upgrades of granite countertops, stainless steel appliances, a bonus room and huge walk in pantry. Must see to appreciate." 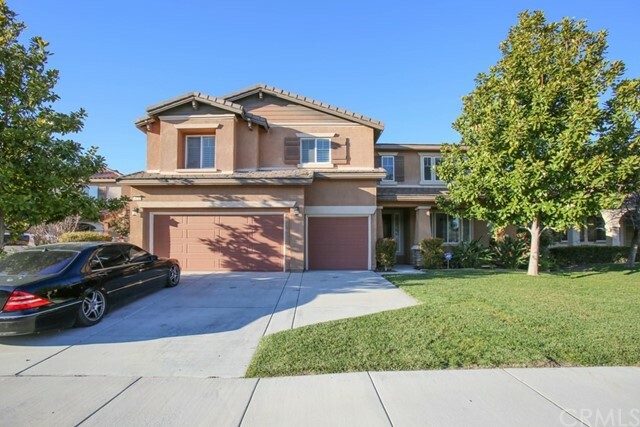 "Welcome home to this beautifully upgraded executive home located in the highly desirable City of Eastvale. This home features 5 bedrooms and 4.5 baths. One large bedroom downstairs with a private entrance, and individual AC unit. Open floor plan with high ceilings. Tile flooring throughout first floor. Great room with cozy fireplace and TV niche, ceiling fan & flush-mounted recessed lighting. Spacious kitchen with large island with granite countertops & breakfast bar. Impressive kitchen with nice cabinetry with stainless steel appliances, buffet bar, walk-in pantry, extra storage closet. Laundry room has a soaking sink. Tile floors in kitchen & bathrooms. The upstairs level has the master bedroom in its own wing.The master bathroom has a roman tub and a separate shower enclosure, it has dual sinks, a vanity & walk-in closet. 3 car garage has lots of storage space. Low HOA. Very easy access to freeways, shops,restaurants, schools, and parks." "Are you looking for a home that is truly move in ready? This is it! 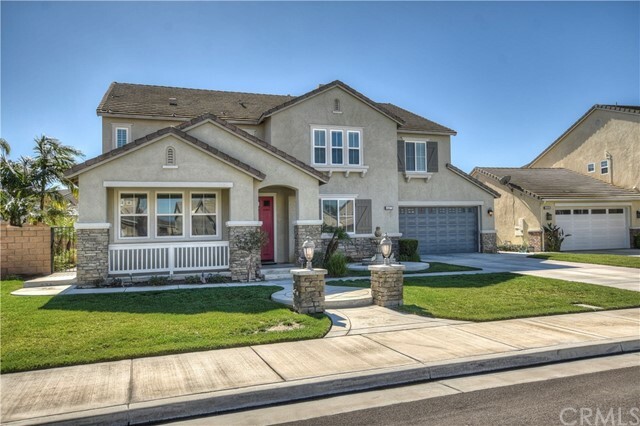 This gorgeous Eastvale gem offers 3,016 square feet of living space including a GUEST HOUSE! The main house has 4 bedrooms, 3 bathrooms, a computer area and loft. One bedroom and full bathroom located downstairs! The guest house has a RARE full kitchen with granite counter tops and self closing cabinets, its own laundry room, living room, bedroom, TWO closets and full bathroom. Upgraded tile flooring and lighting throughout, including ceiling fans in all rooms. Endless upgrades including but limited to surround sound, tank less water heater, WIFI thermostats, home air purifier and air cleaner with Hepa filter. The kitchen has granite counter tops, upgraded cabinets and opens up to the family room, ideal for family gatherings. Full front and rear landscaping with artificial turf and more. VERY low maintenance. Custom patio to match the home, with extensive concrete around the entire property. Concrete and large custom gate on the side of the home offering additional parking for a boat, car and even possibly an RV. Two Ring cameras with spotlights and Ring doorbell included! Walking distance to award wining CNUSD schools and parks. 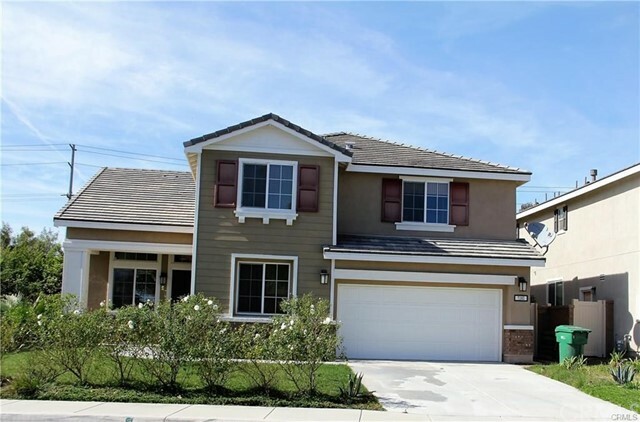 Conveniently located near the Eastvale shopping centers and minutes away from all major freeway. Approx tax rate is 1.5%. No HOA! You MUST see this home to appreciate all it has to offer. Schedule your appointment NOW!" 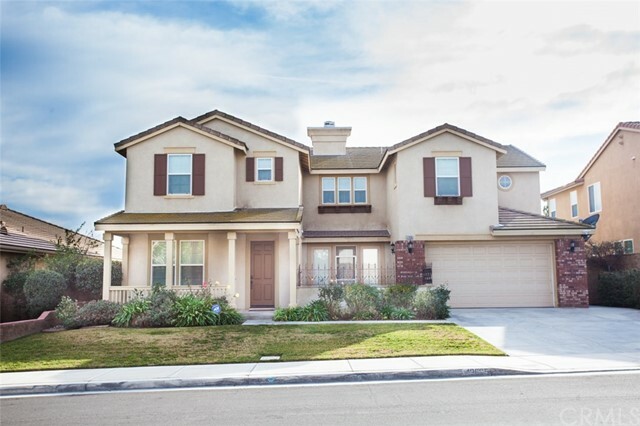 "Great location within the community of Eastvale. Close but not too close to schools. This is a very clean, move in condition home. This is a large home ready for the whole family. Lots of room to relax in the family room; living room; large loft upstairs and the rear yard that is all set up for entertaining or relaxing with the family. ~ There is a large bedroom and full bath downstairs. ~ This home offers 5 large bedrooms and 4 full baths. The master suite has a large master bathroom with large vanity and two separate sinks. The master suite has two walk-in closets. ~ Also notice the R.V. Access ~"
"This Gorgeous Five Bedroom home with a loft has four bathrooms that include a main floor bedroom and full bathroom. Everyone's dream-four car Garage. Granite kitchen, custom cabinets, double ovens with one convection, built in microwave, large walk in pantry, breakfast bar and butlers pantry with more custom cabinets. Desk area for a computer hutch. Huge family room with open floor plan and Beautiful fireplace. Formal living and dining rooms. High ceilings. Large master bedroom with His and Her closets. Spacious Master bathroom with soaking jetted tub, double sinks and separate shower. Upstairs has a separate wing with large loft and three bedrooms and two bathroom for kids or guest. Upstairs laundry room and additional pantry storage cupboard. Centralized vacuums, upstairs and down. Large backyard and Four car garage! Specialized doorbell with alert system and notification. Amazing highly sought after high scoring schools and parks, shopping, restaurants near by." "Sweet Home! 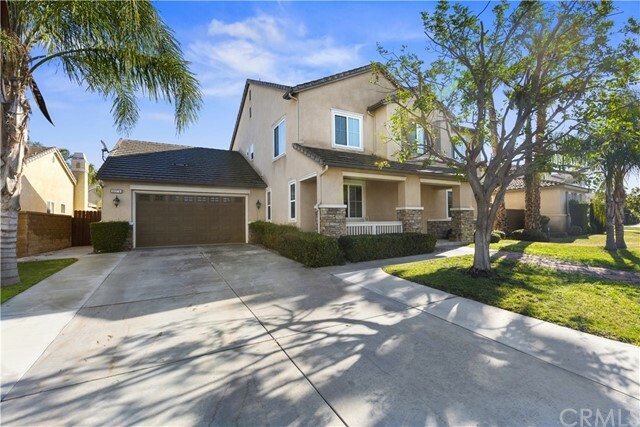 This gorgeous south facing home in Eastvale welcomes you open & spacious floor plan and good Feng Shui energy dynamic for your luck & wealth. Downstairs you could find one bedroom & one bathroom, one family office, pleasingly large family room, and 2 lovely formal dinning areas, provides perfect space for family, entertaining friends, etc. Upstairs you could enjoy tranquility in the master bedroom , and the Jack and Jill bathroom (shared between two bedrooms). The owner takes the advantage of the spacious family room and turned it into 2 rooms. Also this beauty boasts many upgrades such as upgraded kitchen with recessed lighting, granite countertops, stainless appliances and plenty of cabinetry for storage, giving you the joy of life. Embrace nature in the organic vegetable garden in the backyard. There is also paid off solar panel (30,000 value installed in 2018). 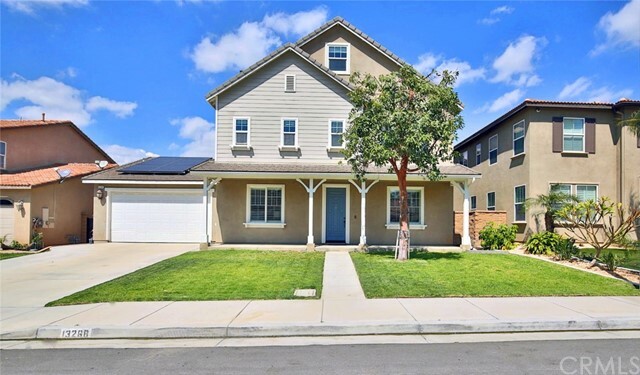 Perfectly situated in the prime location, few minutes away the downtown of Eastvale: few steps to numerous parks, lots of shops (Starbucks/The Home Depot/Target/Costco) , Edwards cinema, restaurants with different style, banks, and the 15/91 freeways. And don't forget the high ranking school in Eastvale." 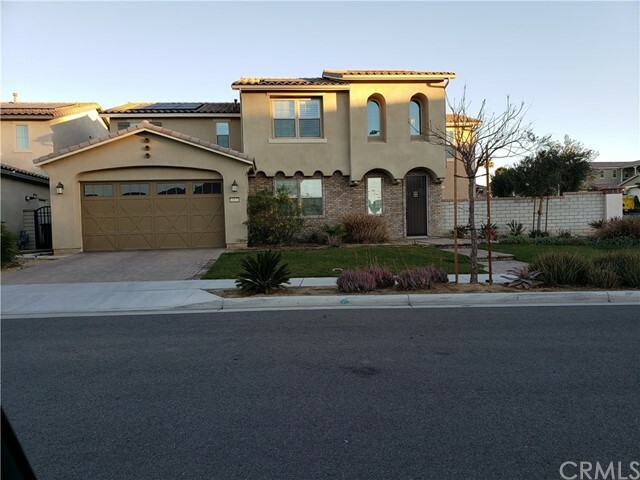 "THIS BEAUTIFUL LARGE EXECUTIVE CORNER HOME IN PRIME LOCATED CITY OF EASTVALE COMES WITH 5 BEDROOMS 4 BATHROOMS(TITLE) FORMER MODEL HOME IN MOVE- IN CONDITION. YOU WILL NOTICE THE OPEN KITCHEN WITH LARGE CENTER ISLAND, BREAKFAST BAR, STAINLESS STEEL APPLIANCES DOUBLE OVEN, BUTLERS PANTRY,AND MORE AMENITIES. THE FEATURES: DEN,A LIVING ROOM, FORMAL DINING ROOM, A LARGE FAMILY ROOM WITH FIREPLACE. UPSTAIRS HAS A SPACIOUS LOFT WITH HARDWOOD FLOORS CAN BE A ENTERTAINMENT ROOM, HUGE MASTER BEDROOM, MASTER BATH HAS SEPARATE SHOWER AND BATHTUB, LARGE WALK-IN MASTER CLOSET. TWO BEDROOMS SHARE WITH JACK N JILL BATHROOM. IT'S JUST FEW MINUTES WALKING TO HARADA HERITAGE PARK, DRIVED MINUTES TO TO SHOPPING CENTER, RESTAURANTS AND SCHOOLS." "The best location in Eastvale. Walking distance to all schools, which has a high rating. Five bedrooms four and a half bathrooms. Formal living room, family room, and dining room. Fireplace in family room. Dining area sliding window leads to a front porch with concrete for a relaxing setting area. Master bedroom with a walking closet. Bonus room / loft area is a great size for a home office or entertainment area. Laundry room in upstairs. Upstairs has two additional bathrooms. Huge enclosed patio in back yard. Enough room for a swimming pool and spa. Area for a vegetable garden, a fruit tree. House is facing north. Five minutes driving to Costco, in & out, and Church. Closed to Harada Heritage Park, community center, All your need for your life style. Easy access to 15, 60 and 91 freeway." "Heartland Community former MODEL home ready to be called yours! 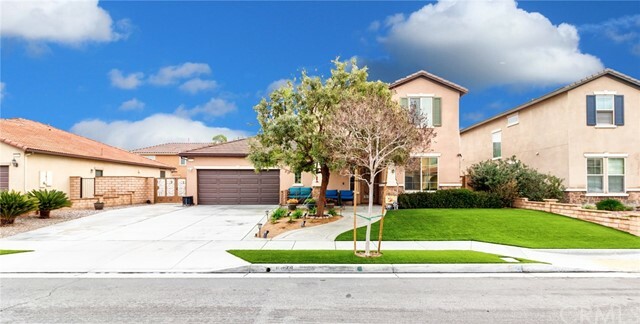 Beautiful turn~key home in the heart of Eastvale, close to schools, shopping and freeways. New flooring throughout, Driftwood oak waterproof flooring with a lifetime warranty. This kitchen is extra large for all of your entertaining needs. Maple wood cabinets with granite counters and stainless steel appliances, butlers bar leading into the formal dinning room. Open concept kitchen to family room with a built in media center. Beautiful home office with built in cabinets, could be easily turned into a 5th bedroom. At every turn you can see all the upgrades this home offers. Once upstairs there is a huge bonus game room or second family room, 4 over sized bedrooms, and a laundry room. The master bedroom/ bathroom won't disappoint either, especially the walk in closet. The backyard is the perfect size for BBQ's all summer or enjoying dinner and drinks while relaxing next to the fountain. Near the beautiful Harada Heritage Park in Eastvale, great public schools, restaurants, and shopping. This home is a must see!" 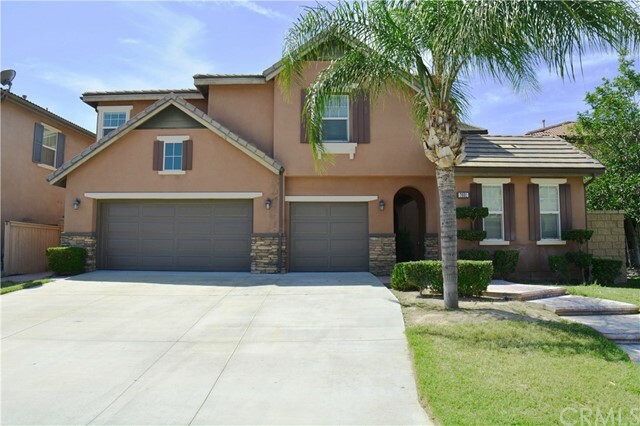 "This Lennar Home is located in the Desirable Community of Eastvale. Large home with 5 bedrooms, 4.5 baths, very large bonus room , and large family room. One spacious bedroom downstairs with large walk-in closet. High cathedral ceilings. Recessed ceiling lights throughout. Central Heating and Air Conditioning System. Located within award winning school district. Close to restaurants, entertainment. shopping, and freeway access. This home has been well maintained. Listing agent relates to the sellers."